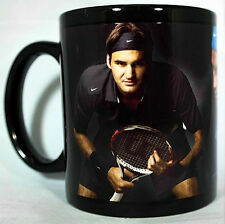 Personalised Photo Mug. Quality Mug. White 11 oz large handle mug. Vibrant and Colourful High Gloss Finish. Fully microwave & dishwasher safe high gloss finished. 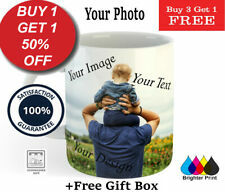 Personalised Mug Add Your Photo Text Image Gift Idea Create Your own. Personalised Full Size Coffee Mug (10oz). All mugs are dispatched wrapped in bubble wrap and placed inside a cardboard mug box. Sealed with another cardboard box marked as Fragile. This funny mug has been designed with heat sensitive properties that changes the mug when you make your favourite hot drink. The Nobody Knows I’m Gay Heat Changing Mug is a standard size with a 300ml capacity. 1 x white mug, printed with your choice of font and your personalisation. If you do not select one of the fonts, this will be chosen for you. TEXT AND IMAGES WILL BE PRINTED EXACTLY AS RECEIVED. Promotional Mugs are a popular and refreshing way to show off your logo. A mug with a personalised touch. A personalised mug is perfect for anybody who loves tea or coffee. White 11oz large handle mug, made from high quality ceramic. Microwave and dishwasher safe. The printing area is 85mm and 210mm long around the mug. On of this model of collage mug can be printed up to3 photos or 3 photos and 1 text. You may personalise your gift mug with any text photo or logo you like. FDA compliant mug and non-toxic Inks. These mugs are perfectly made for use as personalised gifts. These mugs are printed on both sides. Product Information. We make these mug's to our highest standards. The image is printed using the sublimation process directly onto the mugs printing area. The printed image is permanent and will not scratch off or fade. 10 Photo Collage Mug. FREE 2nd Class. Personalised Fortnite Mug. 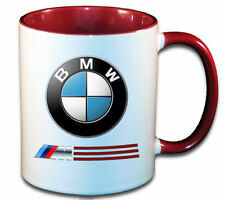 Full colour print wrapped around the mug. 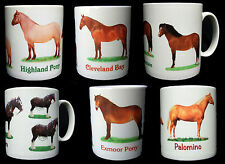 We have more mug designs to choose from. Ideal Gift for a Big Fornite Fan. We will always answer your queries. These mugs are sublimation printed and are safe for 100% microwave and dishwasher. Picture / Image on one side and Text on the other. (1 picture per mug preffered). Picture on both sides. ( 1 picture per mug preffered). White 10 oz large handle mug. Text at the back stating This will allow you to leave special instructions for your order. P roduced in the UK by Cygnet Prints. PERSONALISED TRAVEL MUG - WHITE. You can choose 2 images and any text you wish to have printed on your personalised Travel Mug. Once you approve the design, your Personalised Product will do to production and no further changes can be made. Personalised Mugs Are A Perfect Gift For Anyone And Everyone Especially For Those Who Loves A Nice Hot Drink. White 11oz large handle mug. Picture / Image on one side and Text on the other. Text on both sides. White Personalised Unicorn Mug and Coaster. These mugs are perfectly made for use as personalised gifts. MUG IS DISHWASHER & MICROWAVE SAFE. You will get a personalized White Mug and Coaster. Printed on both sides mug. A perfect gift for a L.O.L DOLL FAN! 'Uni Mum Unicorn' Mug. All mugs are dispatched in Polystyrene Mug Boxes. 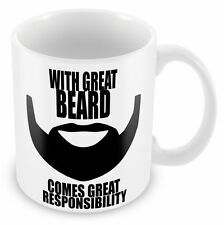 Buy a special mug for that very special person. The perfect gift for any occasion. Add to Favourites. Often imitated, we have been printing original designs for over 3 years. We hope you enjoy your shiny new mug! A perfect gift for a your superhero grandad! Micro-wave and Dishwasher safe. Peaky Blinders Mug. Like our stuff?. Believe it or not you are looking at purchasing a white mug with the design shown in the display on both sides. but you already knew that right?. you to end up with a broken mug. imagine trying to have a cuppa with that!